Lungs are a pair of conical shaped reddish grey colored organs present in the thoracic cavity on either side of the heart. Each lung is covered by a serous membrane called as pleura. Outer parietal pleura and Inner visceral pleura. Between them a space is present called as pleural cavity which is filled with pleural fluid. 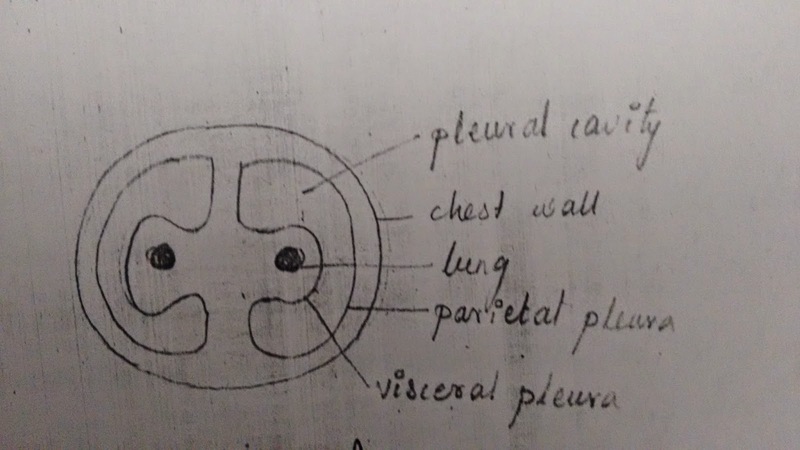 Costal pleura, diaphragmatic pleura, mediastenal pleura and cervical pleura. At birth, these lungs are grayish pink in color, as age advances due to the deposition of carbon particles the lungs will become grayish black in color. Each lung is conical in shape with a narrow apex above and a broad based below. The apex extends into the lower part of the neck. The base is concave and is related to the domes of the diaphragm. The diaphragm separates base of left lung from stomach and spleen. Each lung has territory borders, Anterior, posterior and inferior and 3 surfaces, Medial, lateral or costal and inferior. The anterior border of the lung is straight where as that of left lung is deviated in the lower part called as the cardiac notch. In the lower part it shows a tongue shaped projection called as lingual. The posterior border is rounded. The inferior surface is also called as base. The lateral or the costal surfaces shows impressions caused by the ribs. On the medial surface there is a depression called as hilum which is the entry and exit point of lung. Hilum of lung will give passage to bronchus, pulmonary artery and secondary pulmonary veins. Blood Supply : By bronchial arteries. Venous Drainage : By bronchial veins. Nerve Supply : Vagous nerves. Right lung has tow fissures, oblique fissure and horizontal fissure dividing it into 3 lobes upeer lobe, middle lobed and lower lobe. 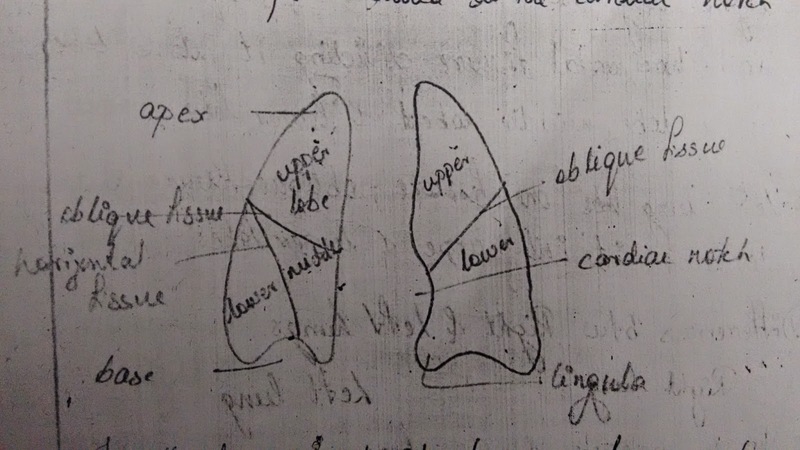 Left lung has one fissure, oblique fissure dividing it into 3 lobes upper lobe, middle lobed and lower lobe. Shorter, broader and has more volume. · Anterior border is straight. · Has two fissures and 3 lobes. · Longer, narrower with less volume. · Anterior border is cardiac notch. Inflammation of lung is called pneumonia. Inflammation of bronchi is bronchitis. In a condition called as bronchial asthma the bronchi are narrowed there by causing difficulty in breathing.